The first day I laid my eyes on these little jewels of Brazil was in 1998 at the most diverse parrot collection in the world, “Loro Parque” in Tenerife, Spain. Rose-fronted Conures are from the Genus Pyrrhura and are now recognized as their own distinct species according to South American Classification Committee (S.A.C.C.) now knowns as Pyrrhyra roseifrons circa 2008. Their natural range is from Peru, Ecuador, Bolivia and primarily Brazil. The most striking of their description is quite interesting, the head of the female is approximately three quarters full of rose fluorescent pink, their breasts are scalloped with white lining the outside of the breast feathers and have burgundy red feathers on their belly below the breast to their vent. I obtained a single pair a few short months after returning from Spain. They were available here for the first time from an importer, I was instantly committed to adding them to my collection. Although they were damaging to my bank account, I was in love with them. I immediately began some research on their likes and dislikes, needs and natural resources for food consumption. During their stay here, I tried to make them feel as comfortable as possible. Being parent-raised stock, they were quite skittish, and acquired their naturally displaced nervousness. I provided privacy to one side of the cage where the nestbox was by adding non-toxic plants. I built a double insulated nestbox in the shape of an “L”. The box measured 10″ vertical by 10″ horizontal by 7″ squared rectangle all the way through. One nestbox was built then was surrounded by styrofoam and another box was built around it. This method with the styrofoam was used to prevent noise from the other closer larger pairs of birds penetrating the nestbox. At the time they were setup, we housed them in a in a 2’x2’x4′ long cage with 1″x1″ mesh. I also had at least 3 perches of varying diameter from 1/4″ to 3/4″ at all times. This pair seemed pretty content and noticed a lot of their natural instincts were imprinted from their parents. This is the characteristic I wanted to preserve to continue to teach their own young to behave as roseifrons as well. They use their alarm calls quite frequently when daily patterns are broken. Examples of this are any people within view or approaching at different times other than routine schedule etc. In a sense, they are very nervous of any change in environment and will sound alarm calls, whereas in their native habitat, any hint of danger and they will immediately invoke ‘fight or flight’. This nature about them is to ensure their survival on the lower food chain. 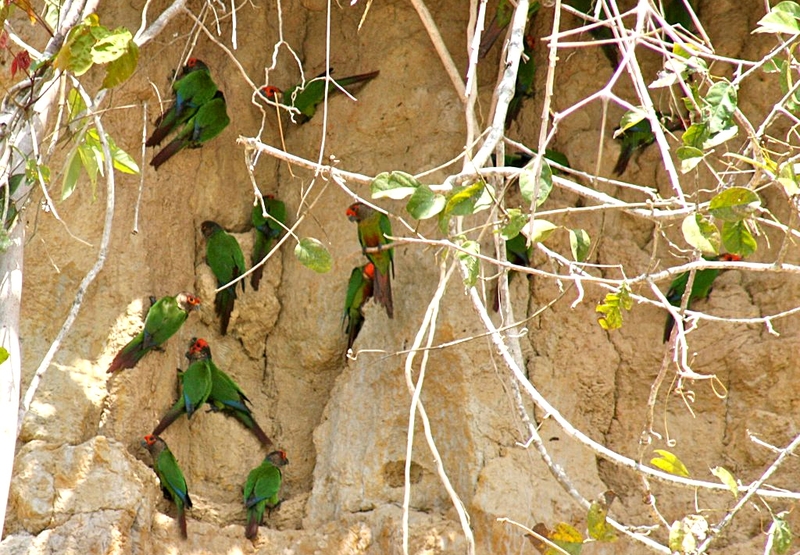 The area they were in during the first season was shared with over 25 pairs of large parrots in less than half of an 1100 sq. ft. basement. In my opinion, this setup was not very ideal for the needs of the birds but practical as most birdkeepers in Canada assimilate this setup. Since then they have all moved to larger cages for flight opportunity and greater amounts of room to exercise. To ensure more reliable breeding was to give privacy to all pairs, for this I used visual barriers for most of the cages but did not for the roseifrons. As a result, they never showed interest in the nest during the day. They were always calling and more concerned with all other activities within their view in the room. This clearly demonstrated fear for their protection by seeing larger birds and may have seen them as predators or invading their territorial space. Title photo: (c) www.birdphotos.com. This file is licensed under the Creative Commons Attribution 3.0 Unported license.